A reader wrote an email regarding a discussion he had on a forum about bike registration. The other chap argued that "if bikes want to use the roads then they should pay for it, just like cars have to." I was asked about bike registration in Europe and my reply became so lengthy that I figured I'd post it here. Feel free to contribute with other points of view and stats in the Comments section. This "bikes should pay" argument is not unknown to me but it is, in many ways, a rather weak argument. Regarding bike registration in Europe, there are half a billion citizens in the European Union alone. 100 million of them ride a bicycle on a daily basis according to the European Cyclists' Federation. None of them are inconvenienced by bicycle registration, least of all the Netherlands or Denmark - the two countries with most bike usage. Firstly, imagine the logistical nightmare of registering tens of millions of bicycles. Firstly you need to pay to develop or adapt a computer system to register them and you need to hire people to run the system to issue registrations and pay for producing licences. My best guess as to the average weight of a bicycle is about 13 kg [30 lbs]. Based on those numbers, a bicycle weighs 0.8% of a car. You don't need a degree in rocket science to see that the weight impact on the roads made by bicycles is marginal. Let's say a car registration costs $100, based on various factors including wear and tear on the roads. Based on that figure, a bike registration should then cost 80 cents. Then you'll have to subtract from those 80 cents. In Denmark we have road taxes and environment taxes built into our car registration, not to mention weight taxes, depending on the car's size. A car's environmental impact is far greater, but a bicycle has none. Let's say a 50% reduction in the 80 cents fee for zero environmental impact, just to pick a number. 40 cents per bike. That 40 cents would be reduced to almost nothing after you subtract adminstration fees. I'm not an economist, but I can already see that the project would not be very profitable. The enforcement issue is another ball of wax. I, for one, would prefer my police force to take care of business more important to society that checking cyclists for registration papers. In short, developing a registration system for bikes would be a monumental waste of taxpayers money and that is in nobody's interest. Campaigns to increase awareness and safety would be more profitable in the long run. It is also worthwhile to consider the very simple fact that more bikes with a marginal impact on the roads means less wear and tear. This reduces the necessity for time-consuming and expensive road works to fix the potholes, etc. It will be cheaper for motorists, not to mention much more convenient not having to suffer construction delays. The cyclist, besides having a marginal impact on the roads, will also end up benefiting society on a whole by transporting him or herself by bike. The health benefits are many and they are well-documented. In direct relation to cars, it is interesting to point of some of the many studies regarding pollution. The level of dangerous, polluting microparticles inside a car are much higher than outside - on a bike, for example. There are a couple of links to earlier posts below regarding this. In Denmark almost 4000 people die each year from pollution from cars. That number is ten times higher than those who are killed IN the traffic. According to a recent study, breathing the pollution from the automotive traffic is more dangerous than merely being the traffic. 3400 people die each year from illnesses directly related to the particles released from the exhaust of cars. On top of that there are 200-500 people who die prematurely from heart disease and high blood pressure caused by the noise generated by traffic. Yes... just the NOISE! I can't even begin to imagine how these numbers will mulitply when applied to any North American city. So... cyclists are actually reducing health care costs and, in effect, freeing up hospital beds for those who need them. They are also increasing their health levels - which will give them fewer sick days and a more effective working life, thereby contributing more positively to the economy. All of the common sense above should somehow lead to rewards for cyclists. A city council that builds segregated bike lanes, thereby encouraging citizens to ride, will be spending less on road works and public health. - For every 1 krone spent, society would save 5 kroner. Now THAT is good economics. In Norway, the Norwegian Public Roads Administration [Vegvesen] actually pays their employees to ride to work instead of driving. Much of the decision is based on the above facts and studies. 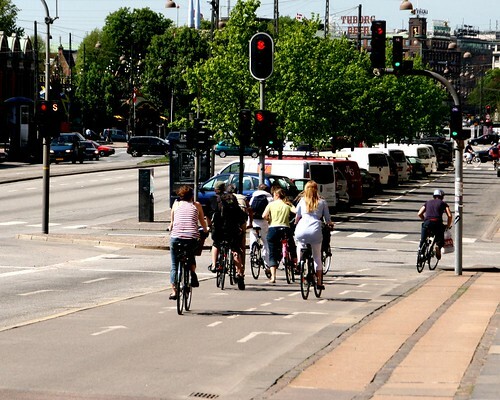 "By encouraging people to bike or walk to work we ensure that they get exercise and, at the same time, relieve the pressure on the traffic net", says District Chief Roar Gartner in Vestfold, Norway. If one encounters this odd argument that cyclists should be made to pay for a registration of their vehicle, I hope these offerings above provide a good point of departure for a counter-argument. Instead of demanding that cyclists pay, motorists should be buying us beer and thanking us on behalf of themselves, their children [present or future], the nation and society in general.